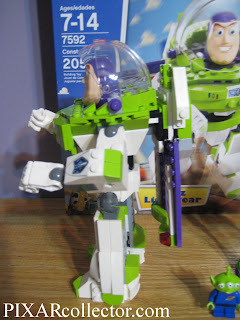 Toy Review: Lego Construct-A-Buzz Lightyear! Is it an unchartered mission in secret space? 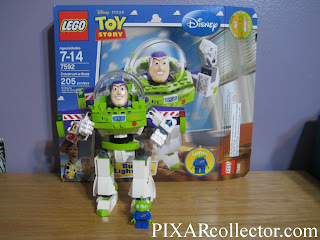 No, its BUZZ LIGHTYEAR! Lego has newly obtained the Toy Story license. Kids and Adults alike just fainted! You can only imagine what Lego is going to do with it, right? Imagine no more, because these toys are starting to hit shelves at Super Target and Toys 'R Us locations, not to mention the online Lego store. 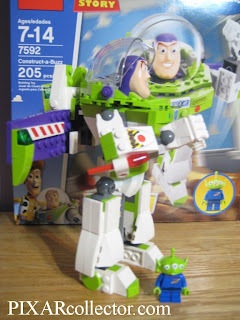 Today we're going to feature the Construct-a-Buzz. The most important part of any Lego set, in this reviewer's opinion, is the mini-figure. Its what lasts in your mind with a Lego set and what you want to ensure that you have for your collection. 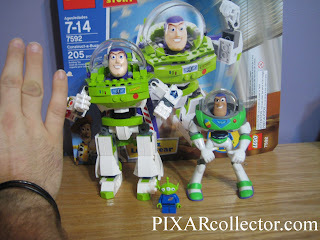 This Construct-a-Buzz comes with..wait for it....and Alien mini-figure! Its adorable. Plain and simple. How difficult is the set? Not very. The recommended age range is 7-14. My 7 year old son got ahold of it and had it built in minutes, so its perfectly on-target for the age recommendations. How does it look? You can see from the pictures...its amazing. Lego has really outdone themselves, like usual. He reminds me of the huge Lego statues you sometimes see as a promotion for their various licenses. He's a great homage to Lego and Toy Story sitting on your shelf. Its great for a collector, because he stays together well and doesn't lose pieces easily. 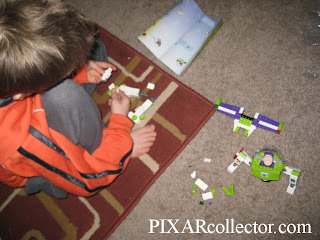 Its great for kids because, well they can build and play with their own Lego Buzz Lightyear! Whats not to love, right? Hey Pixar Fans! We're in the process of moving our news blog over to this new format, so some of the old posts are still missing. They'll be moved over shortly, so please be patient with us! 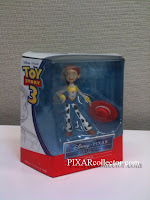 As always you can access us at www.PixarCollector.com! 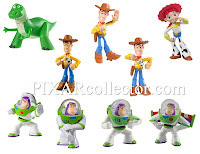 Toy Story 3 at Toy Fair 2010! 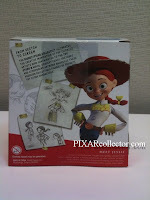 Our pal Jesse Blaze Snider, writer of the new Boom Kids Toy Story comic, gave PixarCollector.com a sneak peek at the first official issue..let me tell you fans, its great! Not only do we get more Booster integrated into the Toy Story universe, but the last page gives us a fun and hilarious jab at the toy industry when the gang is attacked by Buzz Lightyear variants! We recommend this title..go pick it up for you and your kids today!